The Sonian Forest has thousands of species of mushrooms. But don’t forget: mushroom picking is not allowed in the Sonian Forest. Every plant, no matter how small, plays a crucial role in the ecosystem of the Sonian Forest. The ochre brittlegill is a common mushroom species in the Sonian Forest. Starting in summer you can find it in wet weather under the beeches. You can recognise this mushroom by its yellowish, somewhat shiny and funnel-shaped cap. The cap is the visible part of the mushroom: here the spores are formed. Spores are small “grains” that the mushroom needs for its reproduction. Another part of the mushroom is underground: a network of threads that the mushroom uses to absorb nutrients. These threads fuse with the roots of certain trees, such as beech, to form the so-called mycorrhiza. Both the brittlegill and the beech benefit from these mini-connections. The mushroom obtains sugars – that it cannot produce itself – from the beech, while the tree, in return, obtains more water and mineral salts. Mycorrhiza are very important for keeping a forest healthy. Indeed, the growth and vitality of the trees is improved by them. Until recently, Artist’s Bracket (Ganoderma applanatum) made only a very rare appearance in the Sonian Forest. These fungi are at home on thick, dead wood and degenerating trees. In the past, these trees were systematically removed from the forest, and that was no good for the Artist’s Bracket. In the last few years, the dead and dying trees are once more allowed to die and decompose naturally. And that has been a boon to many other species, especially the beetles and the mushrooms. And, the Artist’s Bracket is also thriving again. 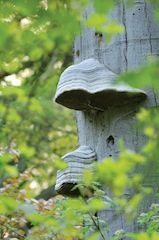 You can find two types of bracket fungi universally in the Sonian Forest: the Tinder Fungus (Fomes fomentarius) and Artist’s Bracket (Ganoderma lipsiense). Though inedible, F. fomentarius has traditionally seen use as the main ingredient of amadou, a material used primarily as tinder, but also used to make clothing and other items. The 5,000-year-old Ötzi the Iceman carried four pieces of F. fomentarius, concluded to be for use as tinder. It also has medicinal and other uses. The oyster mushroom is a mushroom that can be recognised by its grey-blue to grey-brown cap. The foot is white and broadens towards the cap. The gills are white-grey and narrow towards the stem. They produce spores, a kind of mini-seeds. The oyster mushroom feeds exclusively on wood fibre. It therefore only feels at home on dead or dying trees – whether they are still standing upright or not. 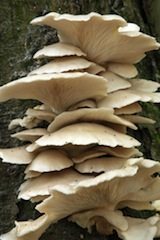 But if the tree is dying, the oyster mushroom is never the cause of that: the mushroom simply benefits from the presence of wood that is already dead to feed itself. To use a learned term, we call an organism with such dietary habits a ‘saprophyte’. 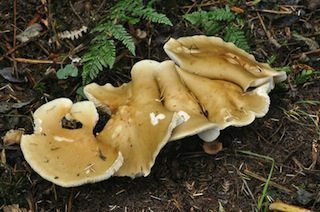 Saprophytes live off of plant tissues or dead animals. Therefore such organisms contribute to the decomposition of organic matter and to the recycling of mineral elements.